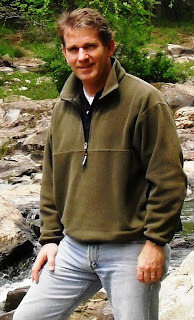 Please welcome author Michael C. Hurley to the blog. He is going to talk to us about his book, Once Upon A Gypsy Moon, and even was kind enough to offer 2 lucky US readers a chance at a copy. So first we will get to know more about the author. A lifelong outdoor enthusiast, Michael Hurley has practiced law since 1984. He is the author of Letters from the Woods and several essays about "slices of life." He lives in Raleigh, North Carolina with his wife Susan and three dogs. Together they have four children. Now, let's take a look at his newest book, Once Upon A Gypsy Moon. Purchase at Amazon US or visit the authors' website. I stepped off a plane at Baltimore-Washington International Airport in August 2009 and made my way to the traffic of cars picking up passengers on the street below. It was an easy flight from Raleigh. I carried no luggage save what fit in a small duffel held with one hand. Walking into the bright morning sun, I felt the still, moist heat that, for a period however brief every summer, makes Maryland seem like Miami. My boat, a thirty-two-foot sloop named the Gypsy Moon, lay just outside Annapolis in a shipyard on the Magothy River, where I had taken her for major repairs six months before. The strain of thirty seasons of sailing since she first slipped her builder’s traces had taken its toll, and the work necessary to fit her out for an ocean voyage had taken five months to complete. I had undergone some less visible but no less critical repairs myself in the past few years. Now the Gypsy Moon was ready, and so was I. My sister and her husband met me at the airport to ferry me to the boat, but not before the obligatory lunch of Maryland crab cakes and farewells to my brother and his family, who live nearby. In the past year and a half, while the boat was berthed in Annapolis, I had relished weekends sailing around the bay in places where, growing up, I had only imagined I might one day stand at the helm of my own boat. Here, in my middle age, I had sailed the Gypsy Moon under the shadow of the statehouse that was America’s Revolutionary War capitol and the place where my service as a legislative intern, at age eighteen, had convinced me never to enter politics. Back in these old haunts, I had fun reconnecting with family and friends and imagining the life I might have had here if I had chosen differently between job offers in two cities—one in Houston, one in Baltimore—twenty-five years ago. But before long, my plans to prove Thomas Wolfe wrong about going home again ran into reality. A sojourn of three decades in Texas and North Carolina had made me more accustomed to the civility of southern manners and less tolerant of the edgy combativeness of life up north. It’s not just that the drivers won’t let you in on the road up there. I recall passing abeam of another boat on the bay near Baltimore and leaning over the rail with a smile, ready to exchange what in southern waters would surely have been a friendly hello, and being startled by a broadside of profanity in- stead. (I had dared to come close.) Dumbfounded, I could manage no reaction but to say “I’m terribly sorry” and tack. It seemed that a good share of the population between Washington and Baltimore had grown accustomed to living with their dukes up. I decided that there is more to the warmth down south than the weather. I was eager to be off again, aboard the Gypsy Moon. Over lunch, I answered questions from my family that gently probed the perimeters of my plans. Nassau seemed far away and nigh unattainable, not just to them, but to me as well. It’s not every day, after all, that one ships out to sea alone. It sounded more daring than it was, yet I not only understood but shared their concerns. The open ocean is no trifling thing, even on the best of days. I feel right at home at the helm of a sailboat, although I didn’t come by that knowledge easily. Growing up in Maryland, I was the youngest child by ten years of a divorced mother of four, spoiled rotten by my two older sisters, too young to know my brother when he was growing up, and all but abandoned at the age of two by an alcoholic father whose absence was most acutely felt in a boy’s unfulfilled dreams of grand adventure. The world of seafaring was the stuff of Hollywood—unimaginable, and far from me. As a child I lived my dreams on a much smaller scale, on creeks and ponds that I could reach on foot, in nearby neighborhoods, and on scouting trips with the aid of the fathers of other boys. It was mostly about the fishing back then, and the smell of wood smoke, and the authenticity of living life in the rough—however briefly, and never far from the ready-to-eat suburban comforts of 1960s America. Those truant days in the woods were wonderful furloughs, allowing my imagination to inhabit a world apart from teachers and tests. I loved the unsupervised freedom of it all. But Chesapeake Bay and the sea that lay beyond were distant and more impenetrable mysteries, brought closer to me only occasion- ally when my brother, Jay, would take me and my sisters out for day sails aboard various dories and dinghies—some he rented, some he purchased, and one he had built himself. I distinctly recall the moment when the bow of a Rhodes 19 sloop, with my brother at the helm, plunged out of the mouth of the South River into the chop of the broader waters of Chesapeake Bay. What was once a horizon of trees and houses became nothing but water and the unseen possibility of whatever lay beyond. I looked into the small space of the cuddy cabin beneath the mast, just big enough for a duffel of food and clothes, and wondered what it might be like if we just kept going. We didn’t. When our hour was up we pointed that fearless ship of dreams sheepishly homeward, paid for the time used, and drove back to the city on dry land. But the infection of that moment and others like it remained with me and would reemerge often years later, beginning with the time when I decided to “borrow” Jay’s fourteen-foot sloop and take her sailing myself. Tell us the story behind the story. How did, Once Upon A Gypsy Moon, come to be? The book started as a series of letters that I published for a small group of close friends and longtime readers. I had decided to make a solo, long-distance voyage aboard a leaking and aged 32-foot sailboat, the Gypsy Moon, three years after my twenty-five-year marriage had ended due to my involvement in an extramarital affair. Events along the voyage became touch points that I employed in writing about the crisis of guilt, anger, self-pity, fear and longing that I was experiencing. The book helped me to see where I had been, decide where I wanted to go, and express the universal need of every man and woman facing a similar failure or loss for understanding, forgiveness, and renewal. What is the message you want readers to take from your book? I didn’t write the book especially for men, but I expect that my experience and what I have to say about it may resonate particularly with men who, like me, have made mistakes that have irrevocably changed their lives. We men are hard on ourselves and are prone to guilt and self-loathing. We hold on to the criticism about ourselves much longer than the praise, and we often refuse to accept that every guy around is just as imperfect as we are. On this voyage, I learned to face the fact that while I can’t undo the harm I caused my family, there is nothing to be gained by wallowing in it. Like a ship at sea, life will move on from your mistakes with or without you. It is better to be aboard and going somewhere—anywhere—than to be adrift in your regrets and going nowhere. I just finished my first novel—a romantic thriller set on the Outer Banks of North Carolina. I am currently working on a proposal to submit it for publication. Thank you for stopping by and talking to us. I have 2 copies up for grabs to 2 US winners! The important thing is to learn from your mistakes. They sometimes mold the person you are today. This book sounds very interesting. I don't know much about boats, but I'd like to read the book. Thanks for having the giveaway.